The white-tailed deer can be found throughout the United States, except for desert regions, parts of southern Canada, and northern areas of South America. They are widely hunted for their meat and fur. They are the most common hoofed animal in North America. Early morning and evening are the best times to see them. Deer have well developed senses of seeing, smelling, and hearing. Besides people, the greatest danger to deer is the mountain lion. However, we do not have mountain lions in Pennsylvania or New Jersey. Deer are known for their reddish brown fur. They often have a large white patch of fur on their necks. The underside of deer is often white. 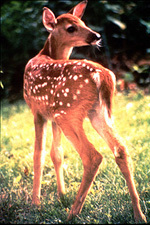 Deer also have a white marking under their tails. When running, the tail flies into the air showing the white tail. Another name for a deer’s tail is a flag. From head to tail, deer can be 4 to 6 feet long. They are about 3 feet tall, with the female a little shorter. Their flags can be as long as 1 foot. Male deer can weigh more than 300 pounds. A female deer can weigh as much as 250 pounds. 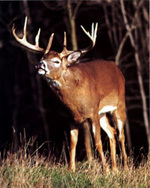 Adult male deer have antlers that divide like two tree branches. They have points or prongs growing from each “branch.” Male deer shed, or lose, their antlers each winter. They grow back antlers before the mating season. Deer mate in late summer or early fall. A male deer, called a buck, will fight for the right to mate with female deer, called a doe. They use their antlers as weapons. After mating, the male deer will leave the female deer. After about 8 months, the female deer will give birth to one or two baby deer. The babies are called fawns. They have white spots on their fur. They can walk from birth, but they prefer to hide in the cover provided by their home. Fawns will move only when the mother comes to feed them. Fawns will leave their mothers after 1 to 2 years. Sometimes deer live alone, other times they live in small groups. In harsh, cold winters, they will gather together for body heat. Deer live 10 years in the wild and 20 years in zoos. Deer live in many places in the wild. They do not have a place called home such as a nest, burrow, or den. Their homes can be in the forests, brush areas, woodland patches, swamps, or even in suburban areas. They move from place to place looking for food. Deer are herbivores. That means they feed from many kinds of plants. Their food is made up of tender roots, grasses, twigs, leaves, fruit, and flowers from many types of shrubs. They will eat small branches of trees during harsh winters. Being such large animals, they have to eat large amounts of food to survive.